General Archives - Page 2 of 14 - VIRTUALIZATION IS LIFE! Top vBlog 2018 – Last few Days to Vote! While I had resisted the temptation to put out a blog on this years Top vBlog voting I thought with the voting coming to an end it was worth giving it a shout just in case there are some of you who hadn’t had the chance to vote or didn’t know about the Top vBlog vLaunchPad list created and maintained by Eric Siebert of vShere-Land. As Eric mentions the vBlog voting should be based on blog content based around longevity, length, frequency and quality of the posts. There is an amazing amount of great content that gets created daily by this community and all things aside, this Top vBlog vote goes someway to recognizing the hard work most bloggers put into the creation of content for the community. Thanks again to Eric Siebert. AWS re:Invent 2018 Recap – Times…they a̶r̶e̶ have a̶ Changi̶n̶g̶ed! I wrote this sitting in the Qantas Lounge in Melbourne waiting for the last leg back to Perth after spending the week in Las Vegas at AWS re:Invent 2018. I had fifteen hours on the LAX to MEL leg and before that flight took off, I struck up a conversation (something I never usually do on flights) with a guy in the seat next to me. He noticed my 2017 AWS re:Invent jumper (which is 100x better than the 2018 version) and asked me if had attended re:Invent. It ended up that he worked for a San Francisco based company that wrote middleware integration for Salesforce. After a little bit of small talk, we got into some deep technical discussions about the announcements and around what we did in our day to day roles. 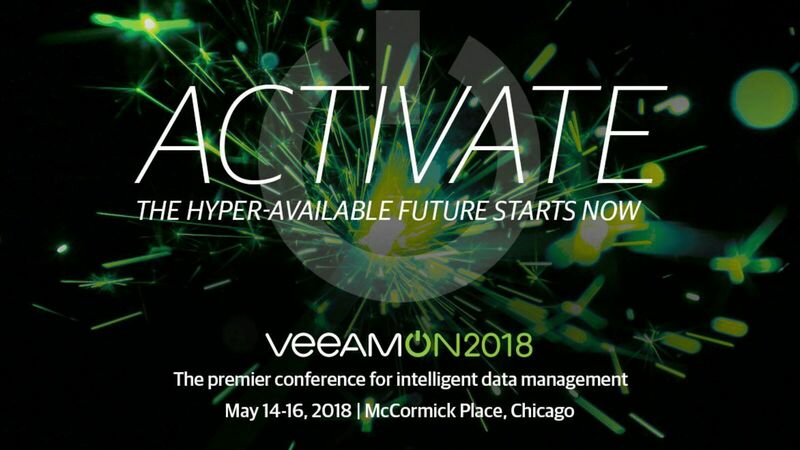 Though I shouldn’t have been surprised, just as I had never heard of his company, he had never heard of Veeam…ironically he was from Russia and now working in Melbourne. The fact he hadn’t heard of Veeam in its self wasn’t the most surprising part…it was the fact that he claimed to be a DevOps engineer. But had never touched any piece of VMware software or virtualisation infrastructure. His day to day was exclusively working with AWS web technologies. 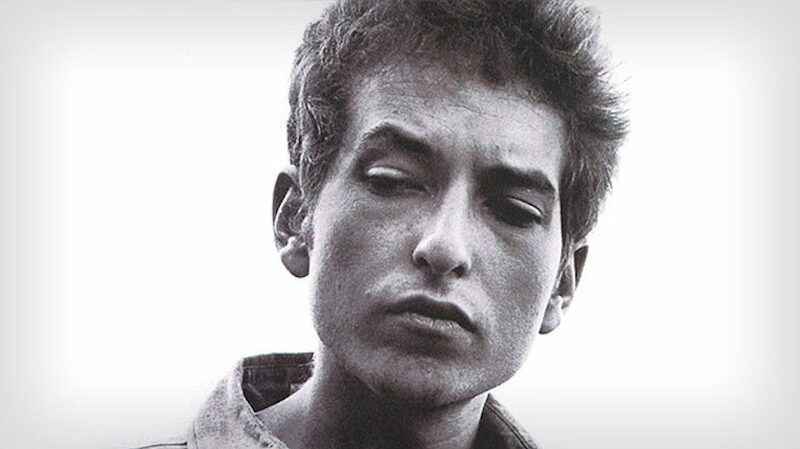 He wasn’t young…maybe early 40s…this to me seemed strange in itself. He worked exclusively around APIs using AWS API Gateway, CloudFormations and other technologies but also used Nginx for reverse proxy purposes. That got me thinking that the web application developers of today are far far different to those that I used to work with in the early 2000’s and 2010’s. I come from the world of LAMP and .NET applications platforms…I stopped working on web and hosting technologies around the time Nginx was becoming popular. I can still hold a conversion (and we did have a great exchange around how he DevOp’ed his applications) around the base frameworks of applications and components that go into making a web application work…but they are very very different from the web applications I used to architect and support on Windows and Linux. The other interesting thing from the conversation was that his Technical Director commands the exclusive use of AWS services. Nothing outside of the service catalog on the AWS Console. That to me was amazing in itself. I started to talk to him about automation and orchestration tools and I mentioned that i’d been using Terraform of late…he had never used it himself. He asked me about it and in this case I was the one telling him how it worked! That at least made me feel somewhat not totally dated and past it! My takeaway from the conversation plus what I experienced at re:Invent was that there is a strong, established sector of the IT industry that AWS has created, nurtured and is now helping to flourish. This isn’t a change or die message…this is simply my own realisation that the times have changed and as a technologist in the the industry I owe it to myself to make sure I am aware of how AWS has shifted web and application development from what I (and from my assumption the majority of those reading this post) perceive to be mainstream. That said, just like the fact that a hybrid approach to infrastructure has solidified as the accepted hosting model for applications, so to the fact that in the application world there will still be a combination of the old and new. The biggest difference is that more than ever…these worlds are colliding…and that is something that shouldn’t be ignored! A few weeks ago I upgraded my NestedESXi homelab to vSphere 6.7 Update 1. Even though Veeam does not have offical supportability for this release until our Backup & Replication 9.5 Update 4 release there is a workaround that deals with the change of vSphere API version that out of the box, causes backup to fail. After the upgrade and the application of the workaround I started to get backup errors while trying to process the main lab VCSA VM which was now running vCenter 6.7 Update 1. All other VMs where being backed up without issue. Processing LAB-VC-67 Error: Requested value ‘vmwarePhoton64Guest’ was not found. The error was interesting and only impacted the VCSA VM that I had upgraded to 6.7 Update 1. I do have another VCSA VM in my lab which is on the GA of 6.7 which was backing up successfully. What was interesting is that it appears like the GuestOS type of the VM had changed or was being recognised as PhotonOS from within the upgraded vCenter on which it lived it’s self. However, due to the chicken or the egg nature of having the management VCSA on the same vCenter when I logged into the ESXi host (also upgraded to 6.7 Update 1) I saw that it didn’t match what was being shown in vCenter. However the same issue occurred. Next I tried to get a little creative and change the Guest OS Type to Other Linux (64-bit) but even though I changed it to that from ESXi…from vCenter (its self) it was still reporting Photon OS and failed. I submitted a support ticket and from the logs the Support team where able to ascertain that the issue actually lied at the Cloud Connect Providers end. I was sending these backups directly to the Cloud Connect Provider, so my next step to confirm this was to try a local backup test job and sure enough the VM processed without issues. I then attempted a Backup Copy job from that successful test job to the Cloud Connect Provider and that resulted in the same error. At my end, I am running Backup & Replication 9.5 Update 3a, while at the provider end, they are running Backup & Replication 9.5 Update 3. 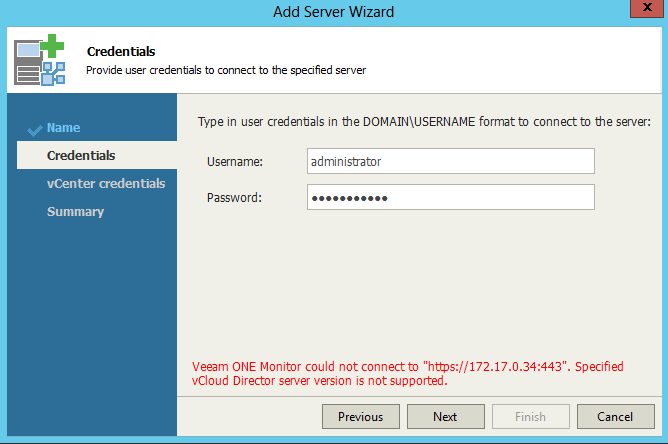 Update 3a introduced supportability to vSphere 6.7 and other platform updates…this included the list at Veeam’s end of support Guest OS Types. 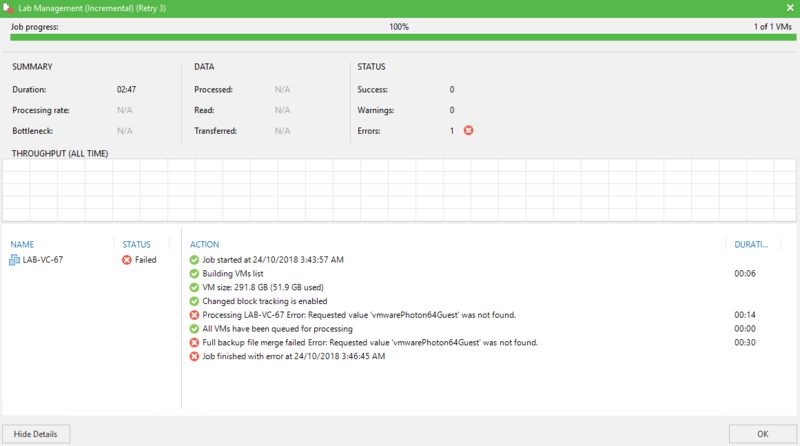 In a nutshell the Veeam Cloud Connect Backup server still needs to understand what type of VM/Guest its backing up in its Cloud Repository. For this to be resolved the provider would need to upgrade their Cloud Connect infrastructure to Update3a…meanwhile, I’m backing up the VM locally for the time being. 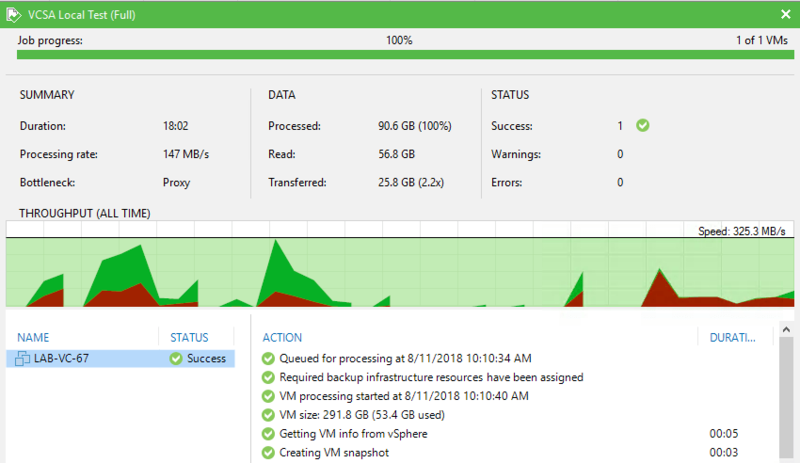 As we approach the release of another Update for Backup & Replication it’s important for Veeam Cloud and Service Providers to understand that they need to keep in step with the latest releases. This is why we typically have an RTM build given to providers at least two weeks before GA.
With vSphere 6.7 Update 1 starting to be deployed to more organisations it’s important to be aware of any issues that could stop tenant backups from completing successfully. This has generally been a consideration for providers offering Cloud Connect over the years…especially with Cloud Connect Replication, where the target platform needs to be somewhat in check with the latest platforms that are available. Hybrid World… Why IBM buying RedHat makes sense! As Red October came to a close…at a time when US Tech stocks were taking their biggest battering in a long time the news came out over the weekend that IBM had acquired RedHat for 34 billion dollars! This seems to have taken the tech world by surprise…the all-cash deal represents a massive 63% premium on the previous close of RedHat’s stock price…all in all it seems ludicrous. Most people that I’ve talked to about it and from reading comments on social media and blog sites suggests that the deal is horrible for the industry…but I’ve felt this is more a reaction to IBM than anything. IBM has a reputation as swallowing up companies whole and spitting them out the other side of the merger process a shell of what they once were. There has also been a lot of empathy for the employees of RedHat, especially from ex-IBM employees who have experience inside the Big Blue machine. I’m no expert on M&A and I don’t pretend to understand the mechanics behind the deal and what is involved…but when I look at what RedHat has in its stable, I can see why IBM have made such an aggressive play for them. On the surface it seems like IBM are in trouble with their stock price and market capitalization falling nearly 20% this year and more than 30% in the last five years…they had to make a big move! IBM’s previous 2013 acquisition of SoftLayer (for a measly 2 billion USD) helped them remain competitive in the Infrastructure as a Service space and if you believe the stories, have done very well out of integrating the SoftLayer platform into what was BlueMix, and is now IBM Cloud. This 2013 Forbes article on the acquisition sheds some light as to why this RedHat acquisition makes sense and is true to form for IBM. That was five years ago…and since then a lot has happened in the Cloud world. Hybrid cloud is now the accepted route to market with a mix of on-premises, IaaS and PaaS hosted and hyper-scale public cloud services being the norm. There is no one cloud to rule them all! 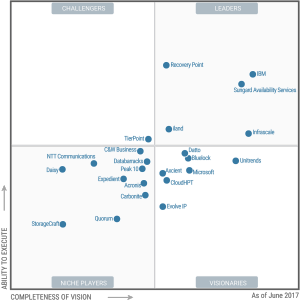 And even though AWS and Azure continue to dominate and be front of mind there is still a lot of choice out there when it comes to how companies want to consume their cloud services. Looking at RedHat’s stable and taking away the obvious Linux distro’s that are both enterprise and open sources the real sweet spot of the deal lies in RedHat’s products that contribute to hybrid cloud. I’ve heard a lot more noise of late about RedHat OpenStack becoming the platform of choice as companies look to transform away from more traditional VMware/Hyper-V based platforms. RedHat OpenShift is also being considered as an enterprise ready platform for containerization of workloads. Some sectors of the industry (Government and Universities) have already decided on their move to platforms that are backed by RedHat…the one thing I would comment here is that there was an upside to that that might now be clouded by IBM being in the mix. Rounding out the stable, RedHat have a Cloud Suite which encompasses most of the products listed above. CloudForms for Infrastructure as Code, with Ansible for orchestration…together with RedHat Virtualization together with OpenStack and OpenShift..it’s a decent preposition! Put all that together with the current services of IBM Cloud and you start to have a compelling portfolio covering almost all desired aspects of hybrid and multi cloud service offerings. If the acquisition of SoftLayer was the start of a 20 year trend then IBM are trying to keep themselves positioned ahead of the curve and very much in step with the next evolution of that trend. That isn’t to say that they are not playing catchup with the likes of VMware, Microsoft, Amazon, Google and alike, but I truly believe that if they don’t butcher this deal they will come out a lot stronger and more importantly offer valid completion in the market…that can only be a good thing! As for what it means for RedHat itself, their employees and culture…that I don’t know. 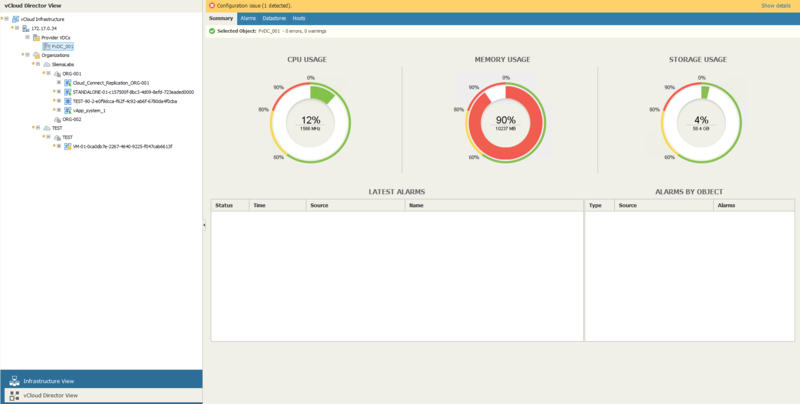 Earlier this week, Runecast released into General Availability version 2.0 of their vSphere analyser platform. I’ve been a keen follower of the progress of Runecast since their inception a couple of years ago. There was a space in the market to be filled and they have been able to improve in the initial release by releasing new functionality often. It wasn’t that long ago that they added vSAN support…and more recently NSX support. Ability to store and display all detected and resolved issues over time for every connected vCenter. The completely new monitoring dashboard with The Most Affected hosts and trending. Usability, performance and security improvements for increased ease of use. Latest VMware Knowledge Base updates. First thing to notice in the new release is the new Dashboard that has been improved and for mine is now more logically laid out. But for me the biggest feature added in this release is the enhancement to Historical Trending and a new analysis function. As someone who spent a time managing and operating vSphere platforms over the years, the ability to see trends is crucial in troubleshooting. 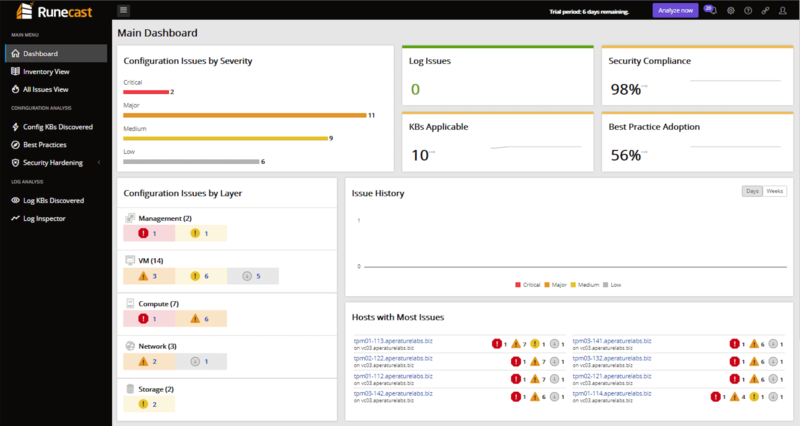 Historical Analysis is new in version 2.0 and aims to help isolate the root cause of a reported incident as fast as possible and detect new problems caused by product update or configuration changes. 2.0 will store at least 3 months worth of vCenter, vSAN and NSX-V scan results, including issue description. This provides trending information on the dashboard. The introduction of PCI-DSS checks is something that will assist in compliancy situations. As someone who has had the pain of going through compliancy, any tool that makes the process easier is welcomed. Im looking forward to meeting up with the guys at VMworld 2018 in Las Vegas next week and I would recommend and vSphere admin to take a look at Runecast! It’s never an issue with DNS! Even when DNS looks right…it’s still DNS! I came across an issue today trying to upgrade a 6.5 VCSA to 6.7. The new VCSA appliance deployment was failing with an OVFTool error suggesting that DNS was incorrectly configured. 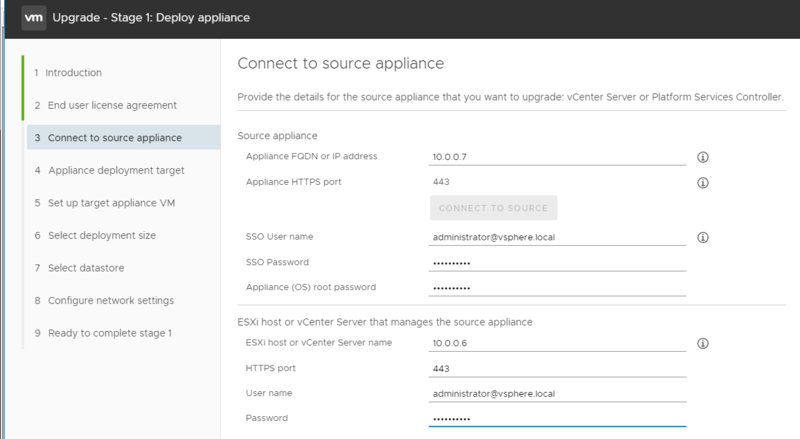 Initially I used the FQDN for source and target vCenter’s and let the installer choose the underlying host to deploy the new VCSA appliance to. Even though everything checked out fine in terms of DNS resolution across all systems I kept on getting the failure. I triple checked name resolution on the machine running the update, both vCenter’s and the target hosts. I even tried using IP addresses for the source and target vCenter but the error remained as it still tried to connect to the vCenter controlled host via it’s FQDN resulting in the error. After doing a quick Google search and finding nothing, I changed the target to be an ESXi host directly and used it’s IP address over it’s FQDN. This time the OVFTool was able to do it’s thing and deploy the new VCSA appliance. The one caveat when deploying directly to a host over a vCenter is that you need to have the target PortGroup configured as an ephemeral…but that’s a general rule of bootstrapping a VCSA in any case and it’s the only one that will show up from the drop down list. While very strange given all DNS checked out as per my testing, the workaround did it’s thing and allowed me to continue with the upgrade. This didn’t find the root cause…however when you need to motor on with anupgrade, a workaround is just as good!